My first visit to the Ohio Book Store starts with a greeting from proprietor Jim Fallon Sr., “How you doing? 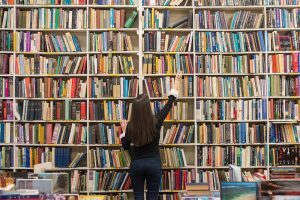 Let me know if I can help you find anything.” This seemed like a fairly common way to greet a customer until my eyes adjusted and I was able to see the swells of books towering over me by way of floor-to-ceiling shelves. 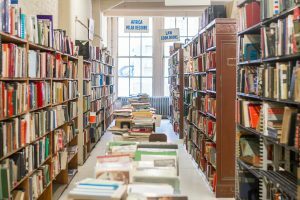 The five floors of written word in the Ohio Book Store are more than enough to quench the most curious minds while simultaneously turning those of us who are “just browsing” into wide-eyed, slow-moving gawkers. So it’s good to have Jim offering assistance to everyone who enters. He’s worked at the store for over 60 years and is the equivalent of a book store Sherpa, a guide into the sacred unknown. In late July, I stopped by with a few bags from Metropole carrying a shaved pork sandwich, a farm egg omelet, a cheeseburger, french fries, a fried oyster po’ boy with a cup of soup and an order of tiramisu. Over lunch, me, Jim and his two sons, Jim Jr. and Mike, chatted about this quiet book store that’s become a destination for book lovers all over the region. 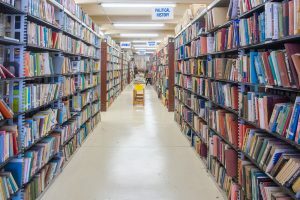 “Every customer says the same thing the first time they walk through the door”, says Mike Fallon with a big smile, “I love that smell.” Something about the smell that’s alive inside used book stores and libraries just triggers childhood memories for so many people. It’s the scent of wonder and intrigue, curiosity and imagination. 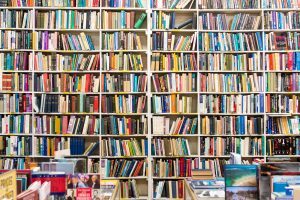 And it might be the main reason that instead of being intimidated by the 300,000 titles on the shelves, people seem to fully engage with this environment on a personal, almost spiritual level. When asked if he can still smell that smell after all these years working in the book store Jim Jr. smiles and says “no” followed by a sincere chuckle. Jim Fallon Sr. started working for the Ohio Book Store in 1957 when he was 13 years old and the store was a few blocks south of the current location. In 1961, to make way for the Federal Building, the store moved to the current location at 726 Main St and it’s been home ever since. 10 years later at the age of 27, Jim purchased the Ohio Book Store from his former boss. Since then, besides buying and selling thousands of books, they added a bindery in the lower level. Bookbinding and repair wasn’t part of the original plan, but when a local shop closed up and offered to sell their hand machines to Jim, he saw an opportunity and went for it. The year was 1984 and besides buying all the hand-operated machines, Jim also hired the two newly unemployed bookbinders from that shop. These guys got to continue working on their craft with an additional role, teaching the next generation, Jim Jr. who was 20 and Mike who was 19. I asked how many books they’ve repaired in the past 30+ years and Mike showed me the work order slip he was currently working on, pointing out the number in the top left corner, #28,870. He and his brother have worked on conserving almost 29,000 books to date. When I asked if they spend all day, every day down in the bindery they both laughed. Apparently, they are also efficient in stocking shelves, sweeping floors, opening and closing the store and the many, many other tasks that need to be accomplished daily to keep the store running. I asked how many bookbinders there are in town and Mike responded, “You mean hand binding? Doing what we do? On this scale… none that I know of.” Which is great for them. People travel far and wide to have their family Bibles and cookbooks and childhood novels repaired, whether it be torn pages or missing covers, they can fix it. But it’s not just replacing the old with the new, as craftsmen they always look to preserve as much of the original material as possible and anything they add is done with a process that’s reversible. It’s book conservation. During my visit, I spied a one-hundred-year-old family Bible, a first-edition of Grapes of Wrath, and a copy of Where the Wild Things Are on their work table. Saturdays are usually the busiest day for them. For a store that’s never spent a dime on advertising, they have quite a reach, drawing customers from well outside of the I-275 Loop. During the week it’s mostly full of locals thumbing through art and philosophy books, old Time Magazines, vintage illustrations, and advertisements, or one of the many Cincinnati specific books that the guys at the shop publish themselves. Book prices are handwritten in pencil on the inside covers and the prices are low. Most days they have a cart parked on the sidewalk with books that are marked FREE. It’s never a bad thing to entice the people of your community to pick up a book and read. Whenever you decide to stop by, do yourself a favor and let yourself to fall down the rabbit hole that is the Ohio Book Store. In the words of Jim Jr., “if you come here looking for a specific book, we probably won’t have it. But there’s a good chance you’ll find something similar.” Here, you’ll often discover something else along the way. 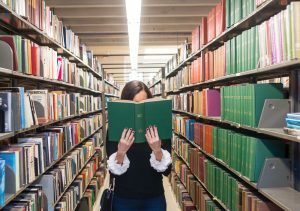 You may leave with a rare book from the 15th century or a college yearbook from 1942, but no matter what it is, I guarantee it will have that good smell of nostalgia attached to it. The Ohio Book Store is located at 726 Main St, Cincinnati, OH 45202—less than a couple blocks east of 21c Museum Hotel Cincinnati. They are open 9 a.m.– 4:45 p.m. Monday thru Friday and 9 a.m. – 4:30 p.m. on Saturdays. You can find more information about the Ohio Book Store here. Photos provided courtesy of Olivia Johnson and her Cincinnati lifestyle and fashion blog Baubles to Bubbles. Check out Olivia’s take on the Ohio Book Store on her blog.